Age, daily wear and tear, accidents, and decay all damage teeth and negatively impact your oral health. Dr. Holmes, Dr. Revel, and Dr. Lowry use advanced methods and materials to create smiles that look and feel better than the original! Our dentists deliver conservative solutions that enhance dental function and preserve as much natural tooth structure as possible. The results are life changing. 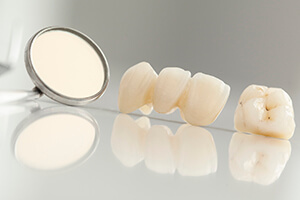 We’re pleased to offer quality solutions to strengthen and renew smiles. Our dentists place white crowns and fillings that look natural look and return comfortable function. We design quality replacement teeth – including fixed bridges and custom dentures and partials – to restore incomplete smiles. Our precision partials contain special attachments that are hidden from view for seamless beauty. Dr. Holmes, Dr. Revel, and Dr. Lowry use their advanced training in endodontics to perform single-visit root canal therapy and preserve internally damaged teeth from extraction. Your smile is our top priority here in Pasadena, TX – and it shows! If you have a tooth that is injured, badly decayed, or cosmetically flawed, custom-made dental crowns are an ideal solution for treatment. These restorations are designed to cover the entire visible surface of the tooth, repairing its structure while also preserving what remains. Crowns are also often paired with dental bridges, which can successfully replace consecutive missing teeth in a sturdy and fixed fashion. Instead of traditional amalgam, our team is proud to now offer tooth-colored fillings as much more conservative and aesthetically pleasing alternative for the treatment of cavities! Our doctors use composite resin, which comes in many shades that can be precisely matched to your original enamel for a virtually seamless result. The lack of metal also means that the new filling will be much more comfortable and less prone to temperature-related sensitivity as well. Dentures have been around in some shape or form for hundreds, even thousands of years, and today, they’re better than ever for patients who prioritize affordability and convenience in their tooth replacement solution. Our team at Pasadena Family Dentistry offers both full prosthetics (designed to replace an entire arch of teeth) and partials (designed to replace certain teeth along a single arch), which are removable in nature for easy cleaning and separate storage during sleep. Looking for more permanence? 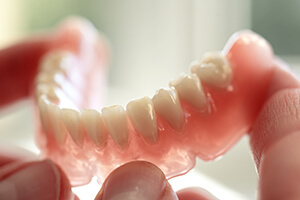 Implant-retained dentures are also available! Here in Pasadena, we strongly believe that it’s never too late to regain a strong, complete, and functional smile. 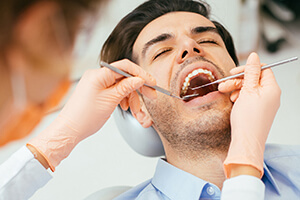 If you’re feeling overwhelmed by the number of dental problems you’re facing, talk to our team about the possibility of undergoing full mouth reconstruction. 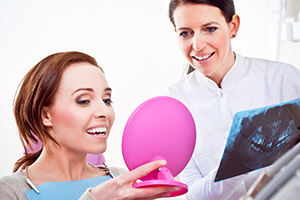 These plans are personalized to include the restorative services that your teeth need to thrive once more, and our doctors will be happy to arrange them in a way that benefits your budget and schedule. While your teeth may look relatively simple on the outside, they actually contain several layers, with each one being more vulnerable than the last. 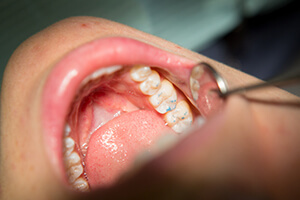 When an infection or a traumatic injury is severe enough to penetrate all of them down to the inner pulp, it can threaten the tooth’s continued existence. Thankfully, root canal therapy can remove dangerous bacteria and help your smile stay wholly natural. Despite our doctors’ best efforts, extracting one or more tooth is sometimes necessary for the sake of the patients’ continued wellbeing. This is most common with “wisdom teeth” (third molars) because the modern mouth usually does not contain enough space to accommodate their late arrival, leading to painful impaction, higher risks of infection, and other serious concerns. Teenagers and adults can rest assured that if we determine extraction is necessary, your comfort will be well-maintained throughout the procedure with the help of sedation dentistry and other amenities.